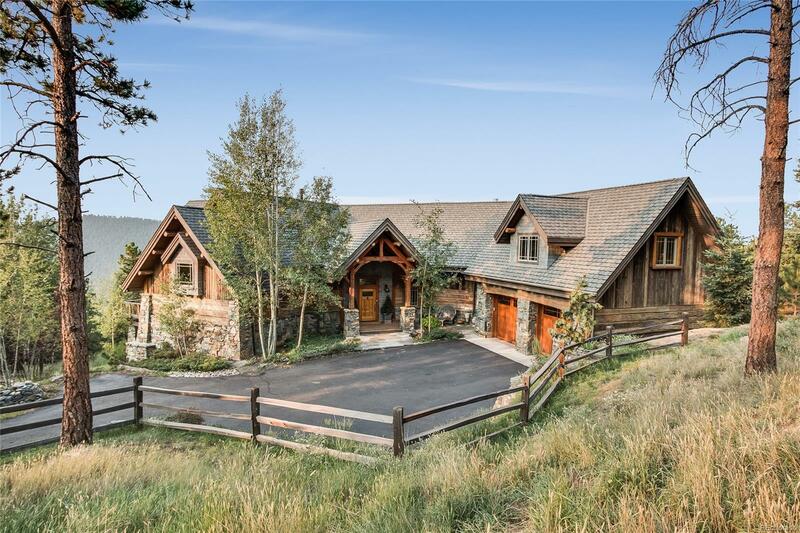 This rare opportunity provides the ultimate Colorado living. Perfectly situated on almost 42 acres to capture Pike's from your pillow. One step in, it becomes apparent that this home parades sky-high ceilings, custom finishes and jaw-dropping views. Sun-drenched ambiance flows through all of the massively proportioned rooms that include a main floor master suite, grand living room, dining area and a gourmet chef's kitchen. High ceilings, genuine timber frame from Georgia, walls of windows, granite countertops, a mud room to dream about, and a walk-in pantry to check every item on your list. Endless possibilities for indoor and outdoor entertaining, an oversized deck with areas for dining and lounging alike, as well as acreage to explore, all with a background of Pikes. Outdoor spaces have been thoughtfully designed and professionally completed. The location of this home is ideal and provides easy access to Hwy 285, Conifer, and even Denver.